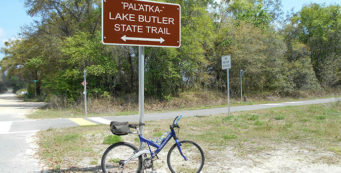 Betty Steflik Memorial Preserve | Florida Hikes! Nestled in an unexpected corner of Flagler Beach, Betty Steflik Memorial Preserve protects more than 200 acres of mangrove marsh, mud flats, and coastal uplands right on the edge of this downtown beach community. Established in 1995, an extensive network of boardwalks carries you along estuarine creeks and out to the Intracoastal Waterway, offering panoramic views at every turn and excellent birding opportunities along the way. Linked to the network of boardwalks is a loop trail through a maritime hammock and a coastal scrub. Fun to explore – especially when bird activity is at its peak at dawn or dusk – it’s a by-the-sea treat for your next beach visit. 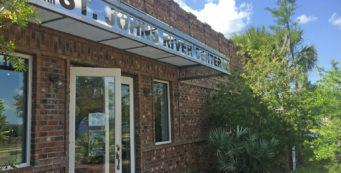 There are three places you can access the preserve. I did so from the Moody Boat Launch, at the end of Moody Lane, which is the farthest point west. 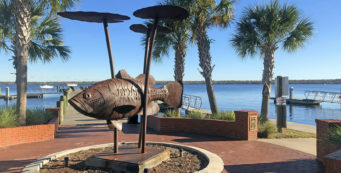 From the east, you can literally walk into the preserve from downtown from an access point off Flagler Avenue at a city park adjoining the Flagler Beach Public Library. The primary preserve entrance, which I discovered later, is down a one lane shellrock road built through the mangrove swamp leading to a large parking area with restrooms and picnic tables. The trail loops around it and branches off to the southeast and northwest as boardwalks. The meandering “Marsh Walk,” as the locals call it, is a weathered old boardwalk with character, undulating up and over black mangrove marshes. Starting first with a short segment along the Intracoastal adjoining the busy boat ramp area, you cross over the boat ramp and start down the walkway. It crosses over a tidal creek lined with black mangroves, their pnumataphores obvious, rising out of the swamp mud like skinny cypress knees. A green anole skitters across the dark wood of the railing. You come to a junction; straight ahead is a spur of the boardwalk that leads down to a little beach on the Intracoastal, perfect for fishing. After taking a peek down this side trail, backtrack and continue along the main boardwalk to cross over the tidal creek again in a pretty spot. After a quarter mile, the boardwalk ends and deposits you on a trail through the shade of wizened cedars in a maritime hammock. The sound of cicadas thrums through the air. You reach a trail junction. Turn right. There are successful lines of mounds in the woods to the left, covered in forest duff. Without interpretation, it’s tough to figure them out. Mounds from Timucuan times, since shells spill out in places, or simply from the dredging of old canals through the mangrove marsh for mosquito control? Or from the Intracoastal itself? Walking through this coastal hammock, you see yaupon holly throughout the understory and many grand old cedars. You pass a bench on the left. A nice cool breeze filters through the woods from the waterway. The trail makes a jog to the left at a very large cedar tree with multiple trunks springing out of its base. A picnic bench sits in the shade on the left just before the trail jogs right to work its way through a hammock of cabbage palms and cedars with tall, skinny trunks. There are more mounds off to the left. The sound of wild parrots is in the air – along this coast, the non-native but well-adapted monk parakeets are common in this area; look for bright light green flashes of feathers in the trees above. You come up to another bench and another segment of boardwalk – a four-way junction. Turn right. You’re greeted by a nice cool breeze as the shade of the cedars gives way to the open air of the salt marsh. The boardwalk rises up to cross a tidal creek – a different one, it appears, than before – where white sulphurs flit between the branches of the mangroves. These small butterflies seem attracted to black mangrove blossoms. This deeper waterway is a good place to watch for manatees. Shield lichen grows thickly in the branches of the young yaupon holly on this island of saltwort, blooming sea oxeye – the salt-loving member of the daisy family – and stands of needlerush. Fossilized, bleached shells spill out of the island, making it more obvious that these are likely middens. You can see ahead to other segments of the boardwalk as the landscape opens up dramatically ahead. Making a sharp left, the boardwalk parallels the Intracoastal while crossing another tidal creek. Watch for manatee and dolphin in this area, especially as you draw closer to the broad waterway itself. Coming to a T intersection, turn right to walk out to an observation platform along the Intracoastal, a good place to watch the sunset. Fiddler crabs mass on the sandspit beaches, and clumps of oysters grow in the shallows. Young mangroves root themselves to form new islands. You reach the observation deck at a half mile. It adjoins an inlet that’s deep enough for aquatic mammals to browse around. An osprey wheels overhead, watching for the mullet that periodically jump out of the waterway. Turn around and retrace your steps back to the T intersection and continue straight ahead, passing a gazebo on the left that will serve as a rain shelter in a pinch. The boardwalk gains some elevation as you cross the next tidal creek. The sulphurs are everywhere, dancing through the air between the black mangroves and sea oxeye. You can now see houses in the far distance, on the edge of downtown Flagler Beach. But there are still a lot of mangroves and marsh between here and there, which it appears a kayak could navigate through, but not a boat. You see wading birds along the shallows and mud flats – white ibis, little blue heron, great white egrets. The cries of osprey fill the air. On the left, the hammock, with its tall oaks and cabbage palms, delinates the edge of the marsh not far off. There are mounds sprinkled through this landscape on which cedars grow, drilled with holes made by large land crabs. Crossing a tidal creek, you reach a sheltered bench, an excellent birding spot.You can watch the slow movement of water with the tides through the creek and basin. Off to the far left, the SR 100 bridge arcs across the skyline in the distance. As you walk along, mangroves crowd up to the rail in places and birds sometimes use the railing as a perch. Another covered bench offers great birding. The boardwalk continues through a low prairie with mangroves and saltwort on the left, the sweep of open marsh on the right. Head down this last long straightaway and you reach the shoreline at a community park along Flagler Avenue. Turn around and face the boardwalk and you’ll see the sign “Betty Steflik Memorial Preserve” at this end. If you’re birding at sunset, this is the best approach to look out over the open water. You’ve reached the edge of the preserve here at 0.9 mile, so turn around and retrace your route back along the estuary boardwalk. Passing the bleached bones of cedar trees set in stark contrast to the greenery beyond, you come back to the first covered bench at 1.1 miles. After you pass the gazebo, make the right turn to head back to the maritime hammock. 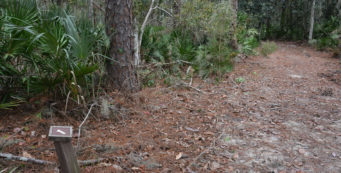 Returning to the four-way boardwalk junction at 1.3 miles, turn right to continue on the shell and sand path through the hammock. There are many squirrels skittering through the palm fronds. While it’s not as breezy as the boardwalk, there’s still a coolness to the hammock, as you’re in the shade – this portion of the path is lined with cabbage palms and canopied by cedars. Passing a bench on the right, continue deep into the hammock as the wind rattles the palm fronds. Yaupon and wax myrtle dominate the understory. An elevated levee on the right holds back the marsh. An unfortunate amount of Brazilian pepper forms a tunnel for the trail. Past the next bench, you can see patches of light off to the left and uphill, exposed sand. The tunnel effect lifts, and you’re under the cedar trees. At a bench at 1.5 miles, the trail is back into the Brazilian pepper tunnel. Coontie peeps out of the understory; it’s not far, as the birds fly, to the great Bulow Hammock, which has the highest density of coontie I’ve seen in Florida. Past the next bench, you can feel the loop of the trail as, through the tall plants, you can see the SR 100 bridge straight ahead as the trail jogs left, back towards the boat launch. The sound of traffic is near but the plants provide deep shade. You slip between a stand of silvery-hued saw palmetto and a cabbage palm laden in poison ivy with leaves so big they look like hickory leaves. The next bench comes up quickly as you emerge into the open adjoining the large main parking area for the preserve; its restrooms are off to the left, as is a picnic pavilion and another trail – the other branch of the four-way junction. 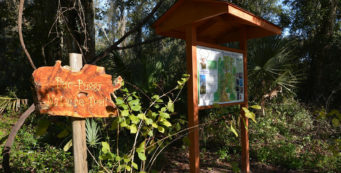 A kiosk has detailed information about the history of the preserve. The trail continues off to the right once you cross the entrance road. Almost immediately, you enter the shade of the oaks and pass another bench. This trail has no want of benches! The footpath leads you through the undulating landscape, the forest floor off to your left has great sprays of fossil shells strewn about. Reaching a junction at 1.7 miles, you’ve completed the loop portion of the trail. Turn right to follow the boardwalk back to the boat ramp parking area, completing a 1.8 mile hike. I recently “discovered” this fantastaic, short hike. Wanting to learn more about it, I re-discovered Florida Hikes. What a wonderful resource. Thank you.